Here are my Top 5 must have shoes for Fall! 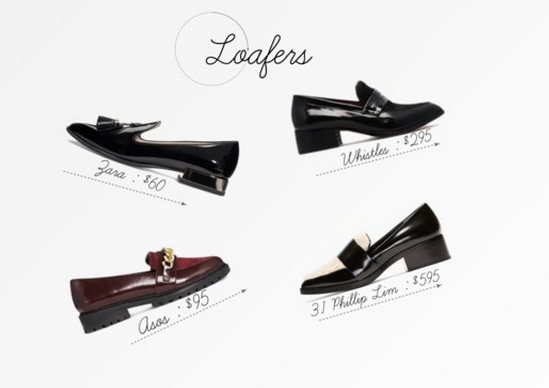 I am loving loafers this fall. I think they are super chic and make seriously any outfit looked more pulled together. I have a couple of different pairs of loafers, and I love pairing them with skinny jeans or even a dress. I have seen them everywhere and have owned at least one pair at all times. I tried to incorporate loafers at all sorts of price points. I love loafers with different textures as well. The 3.1 Phillip Lim ones are a gorgeous combination with leather and a shearling top. So much inspiration, mixing different textures on shoes! Strappy heels are here to stay! They are all over the trend reports for SS15, and why not bring them out in style right before winter? They are timeless, these sorts of heels. They make ANY outfit look chic and classy. Strappy heels can mean a variety of things, from the Nudist sandal by Stuart Weitzmen with the most simple design to the snakeskin strap-ups from Zara. If it's strappy, it's in. 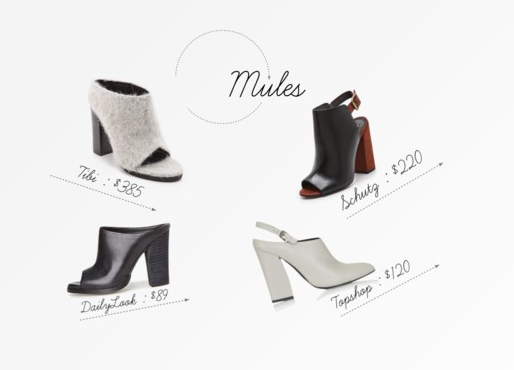 Mules are so damn chic. I love the edge they add to any outfit. I have a pair of Tibi mules that I think are just perfect for when your outfit is mostly basic pieces and you need just a little spark to give it an added edge. Mules were really in this past season, and honestly I don't think they're going anywhere. I've seen them on countless celebrities and bloggers alike. I do love trendy items, but tend not to splurge on trendy things because they aren't classic, and eventually will go out of style, but I think the mule is in this for the long run, at least I hope so. 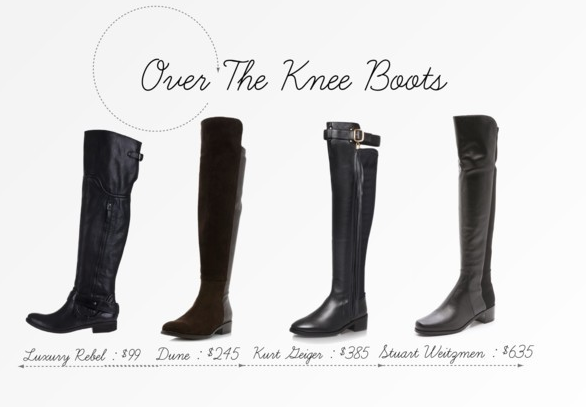 Over the knee boots were HUGE last fall and winter, and I can't wait to wear mine again this year. I have a pair of the Stuart Weitzmen 50/50 boots, and I am still in love with them a year later. I tried to find some boots at all different price points. I feel like you need to invest in a good pair of leather boots. You will probably end up spending less on a great pair of boots rather than buying a new pair every year that will likely have to be replaced. There are so many colors and styles of boot you can get. I usually wear mine with either skinny jeans, or over tights with a skirt. I love sneakers! I think they make any look so darn effortlessly cool. I am LOVING the Converse x Mason Martin Margiela sneaker. So sleek! I put in a couple of different price points because sneakers are definitely not for everyone. If you don't plan on wearing them that often, but want a pair to experiment with, I recommend getting a cheap pair, like the Forever 21 sneakers. 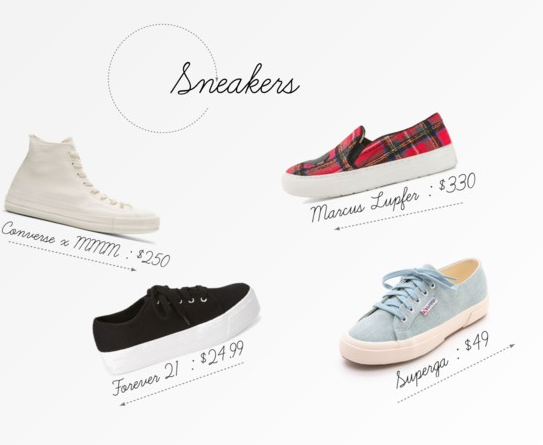 I think Superga sneakers are a great starting point. They have a variety of colors to choose from. I have a pair of Superga sneakers in collaboration with The Row, and the gold hardware on them gets me every time. Sneakers are not for everyone, but they are such a breath of fresh air when we live in a society where everyone wears either heels, flats and boots. Alrighty! Those are my top 5 must-have shoes for fall! I can not wait for the colder weather (I know I will regret saying that in a month) to wear sweaters and some jeans! What kind of shoes do you plan on wearing this fall? Beautiful collection. I found similar collection footwear collection on HouseOfBrides, worth checking out!